The first verifiable kingdom of great power to rise in Ethiopia was that of Axum in the first century AD. It was one of many successor kingdoms to D'mt and was able to unite the northern Ethiopian plateau beginning around the first century BC. Inscriptions have been found in southern Arabia celebrating victories over one GDRT, described as "nagashi of Habashat [i.e. Abyssinia] and of Axum." Other dated inscriptions are used to determine a floruit for GDRT (interpreted as representing a Ge'ez name such as Gadarat, Gedur, Gadurat or Gedara) around the beginning of the 3rd century. A bronze sceptre or wand has been discovered at Atsbi Dera with in inscription mentioning "GDR of Axum". Coins showing the royal portrait began to be minted under King Endubis toward the end of the Third Century. Christianity was introduced into the country by Frumentius, who was consecrated first bishop of Ethiopia by Saint Athanasius of Alexandria about 330. Frumentius converted Ezana, who has left several inscriptions detailing his reign both before and after his conversion. One inscription found at Axum, states that he conquered the nation of the Bogos, and returned thanks to his father, the god Mars, for his victory. Later inscriptions show Ezana's growing attachment to Christianity, and Ezana's coins bear this out, shifting from a design with disc and crescent to a design with a cross. Expeditions by Ezana into the Kingdom of Kush at Meroe in Sudan may have brought about its demise, though there is evidence that the kingdom was experiencing a period of decline beforehand. As a result of Ezana's expansions, Aksum bordered the Roman province of Egypt. The degree of Ezana's control over Yemen is uncertain. Though there is little evidence supporting Aksumite control of the region at that time, his title, which includes king of Saba and Salhen, Himyar and Dhu-Raydan (all in modern-day Yemen), along with gold Aksumite coins with the inscriptions, "king of the Habshat" or "Habashite," indicate that Aksum might have retained some legal or actual footing in the area. From the scanty evidence available it would appear that the new religion at first made little progress. Towards the close of the 5th century a great company of monks known as the Nine Saints are believed to have established themselves in the country. Since that time monasticism has been a power among the people and not without its influence on the course of events. The Axumite Kingdom is recorded once again as controlling part ? if not all ? of Yemen in the 6th century. Around 523, the Jewish king Dhu Nuwas came to power in Yemen and, announcing that he would kill all the Christians, attacked an Aksumite garrison at Zafar, burning the city's churches. He then attacked the Christian stronghold of Najran, slaughtering the Christians who would not convert. Emperor Justin I of the Eastern Roman empire requested that his fellow Christian, Kaleb, help fight the Yemenite king, and around 525, Kaleb invaded and defeated Dhu Nuwas, appointing his Christian follower Sumuafa' Ashawa' as his viceroy. This dating is tentative, however, as the basis of the year 525 for the invasion is based on the death of the ruler of Yemen at the time, who very well could have been Kaleb's viceroy. Procopius records that after about five years, Abraha deposed the viceroy and made himself king (Histories 1.20). Despite several attempted invasions across the Red Sea, Kaleb was unable to dislodge Abreha, and acquiesced to the change; this was the last time Ethiopian armies left Africa until the 20th century when several units participated in the Korean War. Eventually Kaleb abdicated in favor of his son Wa'zeb and retired to a monastery where he ended his days. Abraha later made peace with Kaleb's successor and recognized his superiority. Despite this reverse, under Ezana and Kaleb the kingdom was at its height, benefitting from a large trade, which extended as far as India and Ceylon, and were in constant communication with the Byzantine Empire. Details of the Axumite Kingdom, never abundant, become even more scarce after this point. The last king known to mint coins is Armah, whose coinage refers to the Persian conquest of Jerusalem in 614. An early Muslim tradition is that the negus Ashama ibn Abjar offered asylum to a group of Muslims fleeing persecution during Muhammad's life (615), but Stuart Munro-Hay believes that Axum had been abandoned as the capital by then ? although Kobishchanov states that Ethiopian raiders plagued the Red Sea, preying on Arabian ports at least as late as 702. The end of the Axumite Kingdom is as much of a mystery as its beginning. Lacking a detailed history, the kingdom's fall has been attributed to a persistent drought, overgrazing, deforestation, plague, a shift in trade routes that reduced the importance of the Red Sea -- or a combination of these factors. Munro-Hay cites the Muslim historian Abu Ja'far al-Khwarazmi/Kharazmi (who wrote before 833) as stating that the capital of "the kingdom of Habash" was Jarma. 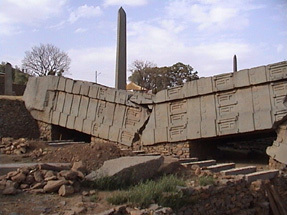 Unless Jarma is a nickname for Axum (hypothetically from Ge'ez girma, "remarkable, revered"), the capital had moved from Axum to a new site, yet undiscovered.